Cardboard is eco-friendly, light, and surprisingly strong, and has therefore had a recent resurgence in contemporary design. However, this humble material was invented and first used for furniture in the 17th century. The 1960’s and 1970’s were a golden age for cardboard experimentation and design. 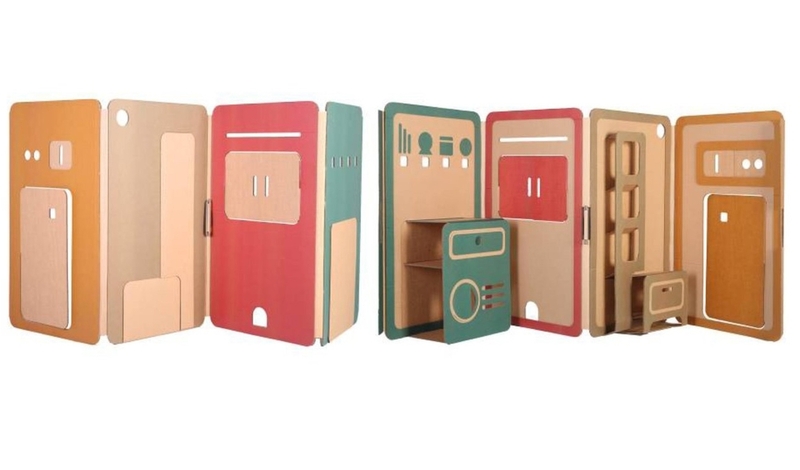 Architects and designers such as Jean Louis Avril, Peter Murdoch, and Frank Gehry all created cardboard collections now viewed as iconic for their clever, sleek designs and innovative use of material. At kM, we have a particular interest in Avril, who experimented extensively with lacquered cardboard pieces for children, like this desk and chair set. Some of our favorite contemporary cardboard pieces for the family home include The Shout Chair by Gavin Atkinson; The Miley Cardboard Desk by Naiise; Wallpockets by Ampersand; Enzo Mari’s reissued Il Posto del Ciocho; Liya Mairson’s My Space; and Paperpod. Looking to get DIY with some cardboard of your own? Check out this sweet playhouse by blogger Ambrosia Girl and get lost in Cardboard Dad’s creations.